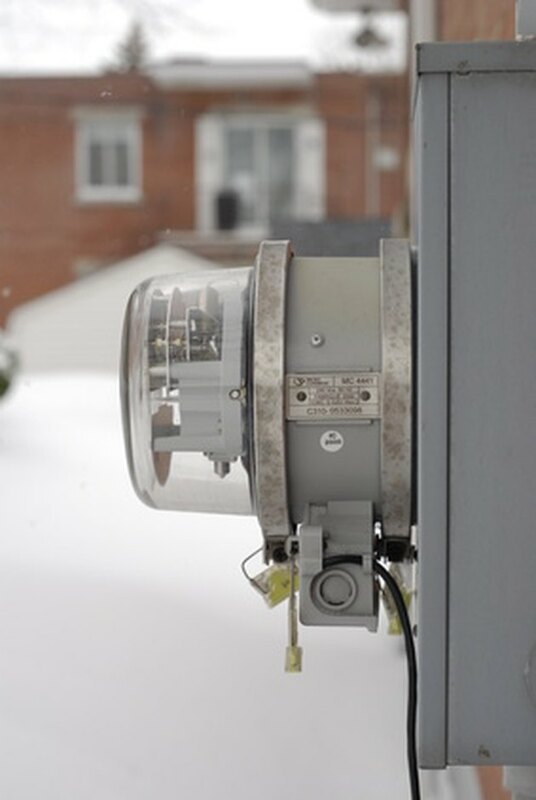 The electric meter is the main part of a home's electrical system and is responsible for connecting the power from the power lines to the home's system. Additionally, it is the device that tracks the amount of power use. The meter is connected to 200 amps of electricity, which can be very dangerous, so contact a licensed electrician if you have any questions before beginning this project. Contact your electric company to have it turn off the power running to your home. Turn the voltage tester on and touch it to the wiring connected to the main feed line from the street to make sure the power is off before any work is down. Strip off one inch of insulation from any wires, if needed. There will be three wires (feed lines) coming in from the street, and two wires (load wires) going into the house. Use the wiring strippers to strip the insulation. Attach the feed line wiring to the rear of the meter. Connect the black and red feed lines from the street to the top set of screws labeled 'feed'. Connect the remaining white wire from the feed line to the center screw, which is for neutral. Attach the home's wiring to the meter. Connect the red and black wires, one each, to the two bottom screws on the rear of the meter, and tighten the screws down on the wires. Slide the rear of the meter into the socket and tighten the screws down to lock it in place. Contact the local electric company to have the work inspected, an electrical tag placed on the meter box, and the power turned back on. Test the power inside the house once it has been turned on for proper feed and operation.